Bill Clinton's "quiet war" on Iraq set the stage for George W. Bush's bloody invasion. Air raid sirens screamed as bombers from the United States and the United Kingdom launched missile strikes on Baghdad. Countries in the Middle East and Western Europe condemned the military action. And antiwar groups were up in arms. An assault on Iraq without the support of much of the international community and over the cries of the antiwar movement — it all sounds very familiar. Yet the bombing in question came on February 16, 2001, two years before the American invasion of Iraq and less than a month after George W. Bush’s inauguration. And on some level, they were. When Bush entered the White House, the US (with help from the UK) was bombing Iraq an average of three times a week. In 1999, the US spent $1 billion dropping bombs in Iraq; in 2000, that number was up to $1.4 billion. Contemporary media reports referred to the bombings — at the time, the longest sustained US air operations since the Vietnam War — as a “quiet war.” If the war was quiet then, it is even less audible today. And our understanding of the Clinton years is the worse for it. Omitting the decade leading up to the 2003 invasion distorts the roots of the war, which wasn’t just a product of post–9/11 hysteria or the creation of various Bush administration personalities. The February 2001 assault was part of a bipartisan policy that put continuous war with Iraq at the center of strategies to maintain US hegemony in the Middle East. Moreover, the Clinton-era policy made the 2003 invasion and occupation of Iraq possible, both in terms of practicality — Bush and UK prime minister Tony Blair dramatically escalated the no-fly zone strikes in the months before the “shock and awe” campaign that opened the Iraq War — and in terms of justification: Clinton and Bush defended their actions by pointing to Iraq’s alleged weapons of mass destruction and the need to topple Saddam at all costs. The Clinton administration’s fixation on weapons and its desire for regime change were clearly on display at a February 1998 town hall, where Secretary of State Madeleine Albright tried to sell the public on bombing Iraq. Albright was repeatedly interrupted by antiwar activists, and pressed about why the US was so keen on attacking Iraq when there were many other, similarly terrible dictators throughout the world. Just a few years later, similar scenes, with different players, would be reprised in the buildup to the Bush administration’s invasion. Much as George W. Bush inherited his initial Iraq policy from Bill Clinton, Clinton inherited his from Bush’s father. Following Iraq’s 1990 invasion of Kuwait, the UN Security Council imposed sanctions on Iraq in an attempt to force a withdrawal. Even after Hussein pulled out, however, the US, which had a veto on the Security Council, refused to allow the sanctions to be lifted. The embargo was war by other means. It not only banned weapons of battle, but technologies that ostensibly had military and civilian uses — like pencils, which the sanctions regime said could be fashioned into bullets. The effects of the sanctions were catastrophic. Iraq experienced shortages of food, medicine, and clean drinking water. And a 1995 Lancet study sponsored by the United Nations Food and Agricultural Organization concluded that 576,000 children under the age of five perished because of the policy, while a “conservative” estimate put the death toll for the same age group at 350,000. Dennis Halliday, a thirty-four-year UN veteran, resigned from the organization in protest after spending a little over a year as the UN Humanitarian Coordinator in Iraq. He said the sanctions constituted genocide. His successor, Hans von Sponeck, also a career UN employee, lasted just two years before stepping down in protest; Jutta Burghardt, then head of the World Food Program, did the same. Albright’s emotionless defense was notably different from Clinton’s. During a lengthy, impromptu interview in 2000, Democracy Now’s Amy Goodman asked the president about the death toll and the resignation of dissenting UN officials. Clinton’s determined parrying underscores the fact that while Bush set the sanctions in motion, Clinton not only embraced them but used them as a tool of regime change. It is he who bears the lion’s share of responsibility for the death and suffering of countless Iraqis. The elder Bush also passed on to Clinton a policy of no-fly zones. These areas — which covered 60 percent of Iraq and, despite US claims to the contrary, were not authorized by the UN Security Council — were purportedly designed to defend Iraq’s Shiite and Kurdish populations. But even France, one of its coalition partners, began to doubt the legality of the actions. After the US and the UK expanded the no-fly zones without international authorization in 1996, France partially pulled out of the coalition. In 1998, it dropped its role entirely. France would later call for the zones’ discontinuation and accuse the US and the UK of violating international law by bombing Iraq. In an Oval Office speech defending the decision, Clinton cited the revolutionary slogan “Don’t tread on me.” The people Clinton ensured would never tread on the US were nine civilians, including Iraqi painter Layla Al-Attar. Five years later, Clinton signed the “Iraq Liberation Act” into law, formalizing the US’s demand for regime change. The legislation, which also appropriated $97 million to fund Iraqi opposition groups, was followed up with yet more military action: Operation Desert Fox. The 1998 Desert Fox campaign was sold to the public as retribution for Hussein’s decision to kick UN weapons inspectors out of the country. Yet earlier that year — when the US seemed poised to bomb Iraq — then–UN secretary general Kofi Annan had traveled to the country to hammer out a new framework for inspections. Under the deal, sensitive sites, like palaces, would be subject to special rules for inspection. It was only when Iraq’s government tried to enforce the deal that the US launched a new round of bombing. Iraqis were saying, “We’re playing by the rules, why aren’t you? If you’re not going to play by the rules, then it’s a game that we don’t want to participate in.” Bill Clinton ordered the inspectors out. Saddam didn’t kick them out. The military assault — which killed an unknown number of civilians — did nothing to aid the efforts of people like Ritter, but they did succeed in escalating the air war against Iraq. From the end of Operation Desert Fox until the 2003 invasion, the US and UK bombed Iraq at least once a week — all under the guise of enforcing the no-fly zone. Disgusted with the situation, Hans von Sponeck, the UN humanitarian coordinator in Iraq at the time, took it upon himself to compile reports on the airstrikes. In 1999 alone, he documented an average of one bombing every three days, killing a total of 120 people and injuring 442. The Clinton years should not be shrugged off as distant history. Bill Clinton played the role of relay runner, handing off the hawkish baton that Bush’s father had first passed to Clinton. While in office, Clinton cemented the goal of Iraqi regime change and eagerly used the instruments of war he inherited — sanctions and the no-fly zones — to achieve this aim. Of course, some of the architects of Clinton’s barbarous policy recoil at any association with Bush. When Amy Goodman asked Albright in a 2004 interview if her boss’s policies set the stage for Bush, she reacted with disbelief. Yet her own tortured relationship to Bush’s war — opposing the timing of the war while maintaining that it was fully justified based on the case Bush laid out — shows the administration’s complicity. For years Albright had deployed the same rhetoric — bogus claims of weapons of mass destruction, accusations that those who opposed military action were supporters of Hussein — that the Bush administration subsequently used to justify its actions. With Hillary Clinton now threatening to become the next commander in chief, questions of culpability are especially salient. While Clinton cannot be blamed for her husband’s decisions, she cited her support for the Iraq Liberation Act to justify backing Bush’s attempt to depose Hussein. Throughout her career, she’s shown herself to be a bellicose militarist who surrounds herself with figures like Albright and Henry Kissinger. Clinton has also displayed a frightening inability to learn from the past, including her husband’s tenure in the White House. She was a staunch advocate of sanctions against Iran; she supported a no-fly zone in Libya (which, much like in Iraq, led to a wider war); and she now calls for a no-fly zone in Syria. 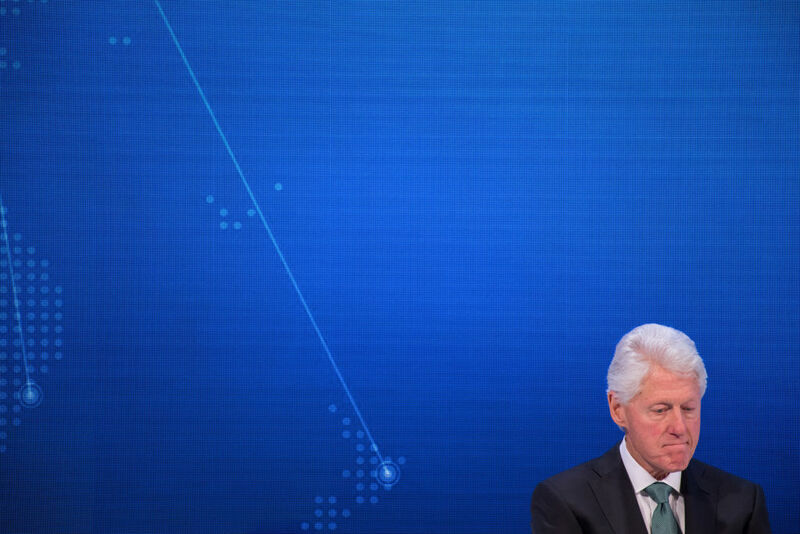 The years of Bill Clinton were not simply a dovish stretch shattered by Bush-era aggression. And if Hillary Clinton has the reins, we can likely expect more of the same. Bill Clinton’s “quiet war” on Iraq set the stage for George W. Bush’s bloody invasion.